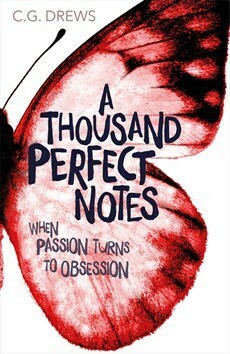 Review: A Thousand Perfect Notes | Live to read. Read to live. Here’s the thing and I’m going to be honest about it: I mainly wanted to read this book because I follow C.G Drews on Instagram and her page is the prettiest and that led me to her blog which is one of my faves, actually and that is that - I wanted to read her book because I enjoy her online presence. That said, I was pretty sure she would be able to write – you can tell from her blog that she can write, I just didn’t quite expect…this. Wow. This is not eloquent. This is why I have not written a book. Basically I wanted to read this book because C.G Drews has a blog that makes me happy and her instagram is beautiful. I knew it would be good. I did not expect it to move me in the way that it did. It’s kind of funny really because I kind of lurk – on blogs, on Instagram, on twitter; I’m not the best at forging forwards and making connections and yet I read the stuff that’s being put out there and feel like I have a sense of the person behind the screen you know? Like I felt sort of proud when I read the post about this book being published and was kind of excited to read it because I felt somehow…I don’t know, invested? All that said, I do not know the author of this book and I did go into it with an open mind – a little nervous in case it was terrible perhaps – and I am unbiased. It’s emotionally charged this book, which, it’s a story about the abuse a young virtuoso suffers at the hands of his Mother – this book takes pushy parenting to the next level, wow – so it was always going to be, but ultimately, it’s incredibly hopeful. It’s an easy read but not an easy story and I don’t know, I just liked it. I got lost in it and I came away from it wishing I didn’t have to, wishing I could stay in that little world just a bit longer and make sure everybody was ok.
And I really really liked it. I liked it because it made me think and it made me feel – even though it didn’t always make me feel good. I liked the dialogue and the description and the way it was written in present third tense. Drews is a really nice writer and for a debut this is really strong – she’s just announced her second book actually and I’m really excited to see how she’s going to build on what she’s done here because what’s she’s done here is good. Her writing is pretty and lyrical and her characterisation strong and clear – all the things I like, thank-you. I liked it because of the story, which is ouchy and raw and intense and yet still so full of love. Beck is this gorgeous tortured character and yet he’s so full of heart. I wanted to put him in my pocket. It was intense though, I feel like that’s a thing I should make clear. This is not a beach read or an easy feel-good read at all and it’s pretty harrowing at times. Don’t say I didn’t warn you. It’s absolutely worth it though, or I thought so at least. I liked it because of the music. Although, I shall not lie, this book is music heavy and I did wonder whether that might be a little too much for people who don’t have any basic musical knowledge. If, for example, you don’t know what an etude is, will you find this book hard because the musical references: there are a lot. Perhaps. Perhaps not. I liked them, to the point I kind of want to dust off that clarinet and see if I can even remember a scale. I liked it because of Beck’s relationship with his Mother – who treats him so so awfully and yet is not just a two-dimensional demon but somebody fully fleshed out with a sympathetic backstory. She’s awful and the way she treats Beck and Joey is awful and hard to read and unforgivable and I hated her, she made me sick, but there’s something to her as well, a glimmer of humanity beneath the surface which made her really fascinating to read about. I liked it because it takes the whole manic pixie dreamgirl trope – which I have negative feelings about for the most part – and turns it on it’s head. You start off thinking ‘oh here we go, quirky female character who’s a little bit Pollyanna; I totes know where this is going’ but it’s more than that - August is excellent and Beck and August are excellent and I loved that this was not your contemporary YA love story. And I have no idea why this review is just a list. This is a new format and I have no idea where it has come from. You get the gist though, A Thousand Perfect Note which is published in June, is a book I liked.